South Australian vegetable grower and industry leader Scott Samwell has received the prestigious Grower of the Year Award, proudly sponsored by Syngenta, at the Hort Connections 2018 National Awards for Excellence Gala Dinner held at the Brisbane Convention Centre on Wednesday 20 June. The national award recognises outstanding achievement across all aspects of horticultural production, including growing, environmental management, staff management and quality of produce, and acknowledges grower commitment to innovation and advancing the Australian horticulture industry. “The Grower of the Year Award is the highest accolade in Australian horticulture and reflects Scott’s dedication to his family’s growing operation, Eastbrook Farms, and his tireless efforts in advancing the vegetable industry, both in South Australia and on a national level,” said AUSVEG CEO James Whiteside. “Scott is an ongoing supporter of new industry research and development and has spearheaded initiatives to host Integrated Pest Management (IPM) and soil health trials on his farm in Mount Barker. He consistently gives his time to share the results of these trials with the wider industry through field days, hosting researchers and contributing to industry communications. The Grower of the Year award is proudly supported by Syngenta, which develops seeds and crop protection products for growers worldwide, and brings together the best in global agricultural research and development to help Australian growers manage risk, drive productivity and realise their crop’s potential. Most recently, Scott worked with Coles to launch the Kalettes® line, crossing kale and Brussels sprouts, which helped to establish Eastbrook Farms as a key player in the national horticultural industry. Outside of his work in the family business, Scott sits on a Strategic Investment Advisory Panel for Hort Innovation, the research and development corporation for Australian horticulture, and also contributes to steering committees for industry-funded projects to ensure they deliver benefits to growers. “Scott is a very deserving recipient of the Grower of the Year accolade and we look forward to seeing his continued contributions to the Australian horticulture industry in the future,” said Mr Whiteside. Hort Connections 2018 is a joint initiative between AUSVEG and the Produce Marketing Association Australia-New Zealand (PMA A-NZ). It is the premiere event for the Australian horticulture industry’s vegetable, fruit, nut, cut floral and nursery sectors, and attracted nearly 3,000 local and international delegates to Brisbane from 18-20 June. 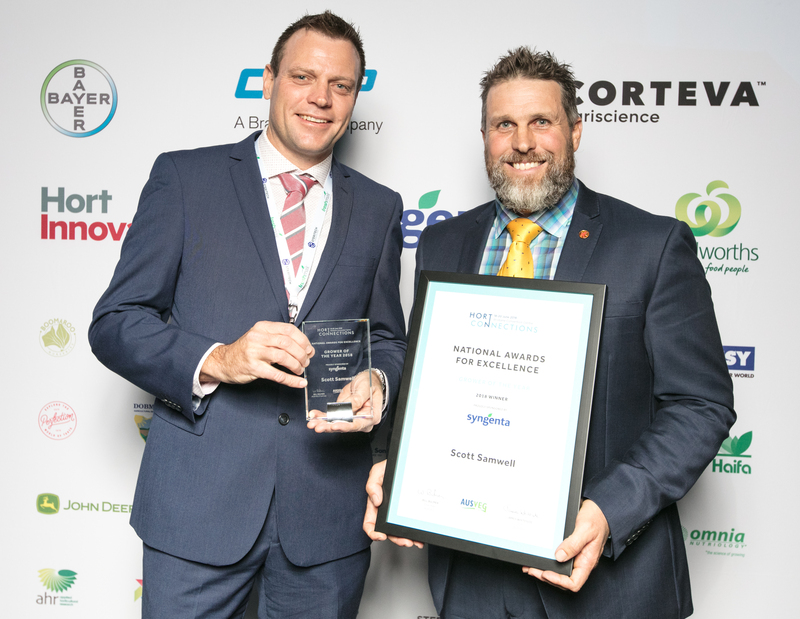 The National Awards for Excellence Gala Dinner was the capstone event of Hort Connections 2018 and honoured growers and Australian horticulture industry members for their outstanding achievements. For photographs, please contact AUSVEG using the details below.